a candidate forum last October. 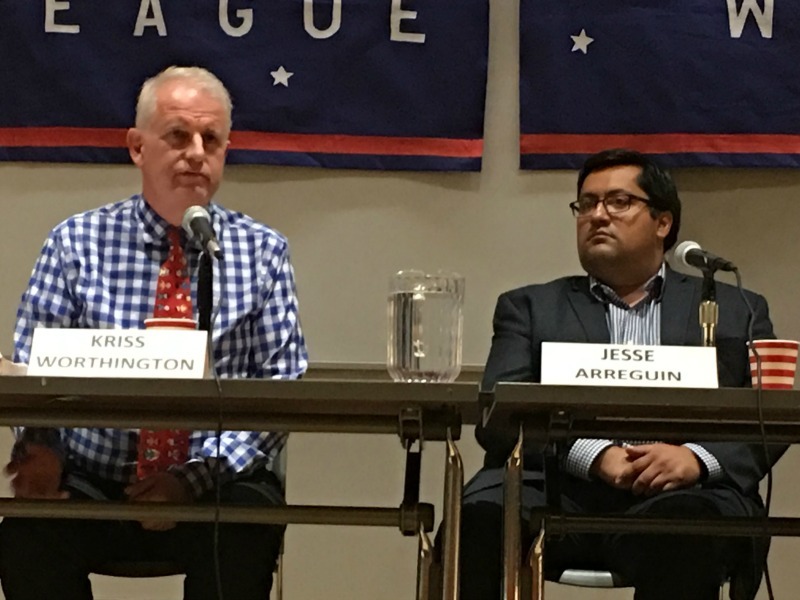 Berkeley Mayor Jesse Arreguin has only been on the job over a month, but his first brush with national media attention may not have fared well. After a near riot ensued in Berkeley last Thursday in response to a scheduled speech at U.C. Berkeley by right wing provocateur Milo Yiannopolous, Arreguin’s response was quizzical. I consider much of what Mr. Yiannopoulos says to be hateful. But I regret and apologize for the white national label. Later, Arreguin’s office released a statement both apologizing for using the term, but essentially using the similar portrayal of “alt-rightest.” The tweet, also containing the mayor’s statement, attracted more than 1,200 responses, from mostly enraged right wing commenters. In addition, the statement appeared to lay blame on others for the aftermath of the scheduled event. Arreguin said the decision to invite Yiannopolous and to cancel the event. The latter move raised hackles among conservatives who faulted the public university for violating free speech. Posted in alt-right, Berkeley, Breitbart, Jesse Arreguin, mayor, Milo Yiannopolous, Nancy Skinner, speech, U.C. Berkeley, white nationalist. Bookmark the permalink. While until a few weeks ago I had never even heard of Milo Yiannopolous, and as a result have very little familiarity with his positions, regardless of whether he is a wonderful person, a horrible person, on the goodness/evil/scale an average person, or a mixture of this and that, however unless he is screaming fire In a crowded movie theater or doing something similar: one, he has a First Amendment right to free speech; and two, those who want to listen to him speak have the right to do so – AND EVEN THOUGH THE PHONIES WHO PRETEND TO BE “LIBERALS” AND ALSO PRETEND TO BELIEVE IN HUMAN RIGHTS DO NOT WANT ANONE TO BE ALLOWED TO SPEAK WHO DOES NOT GO ALONG WITH THEIR POLITICALLY CORRECT LIES, GARBAGE, AND NONSENSE. Still furthermore, since the phonies who pretend to be liberals, and especially the Scams FraudeFIXso and Berserkely versions of such, “know” that they themselves and their fellow Scams FraudsFIXans and Berserkeleyans are the most wonderful, intelligent, sophisticated, and enlightened creatures to be found anywhere, even if Milo is stupid, a racist, a liar, a con man, and an all around horrible person, then still certainly they have absolutely nothing to fear from anything he might say, since obviously anyone as intelligent, sophisticated, and enlightened as the typical phony “liberal” creature that infests Scams FraudsFIXso and Berserkeley would not be fooled by anything Milo has to say.